Happy Memorial Day Jaderbugs! 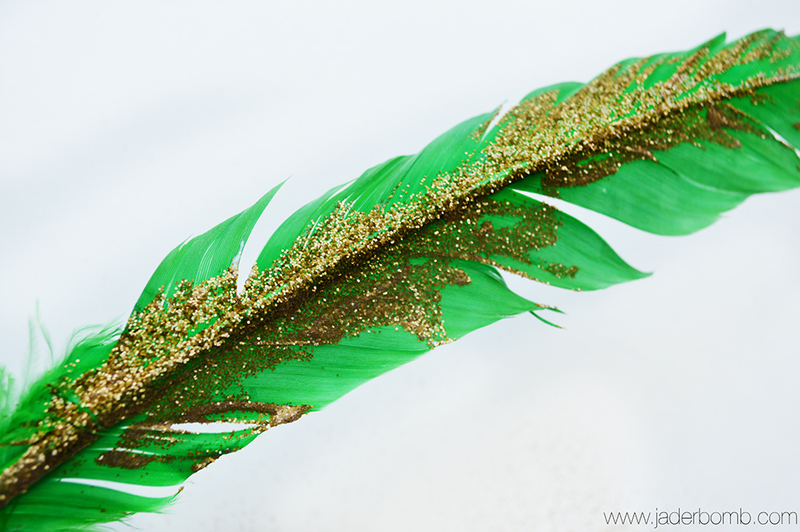 Today I will be showing you how easy it is to glitter feathers!!! So we just recently added on to the house and built this rad room! The inside is full of nice cedar wood and let’s just say it smells like heaven. Every morning we wake up and drink coffee while watching the birds eat their yummy food. This room was supposed to be a “hang” out room however it now has turned into my night time office. I love it really. I go in there and zen out. There was a few things missing in this beautiful room like…. 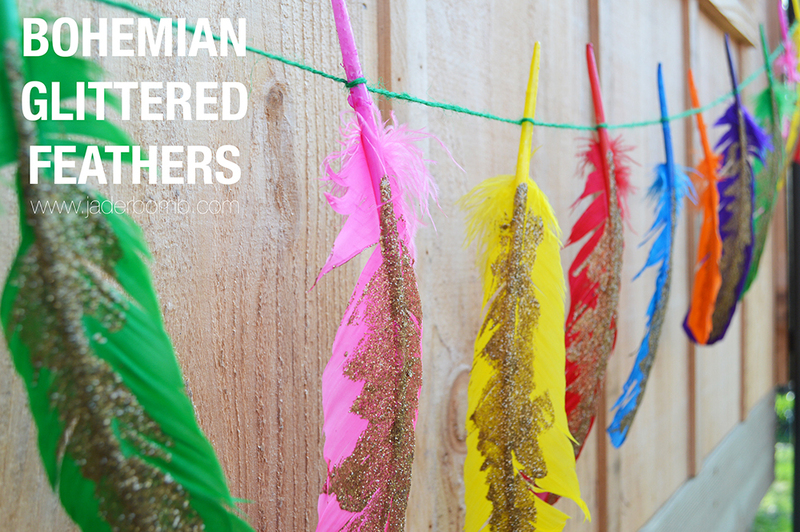 COLORFUL GLITTERED FEATHERS!!! What is a girl to do? 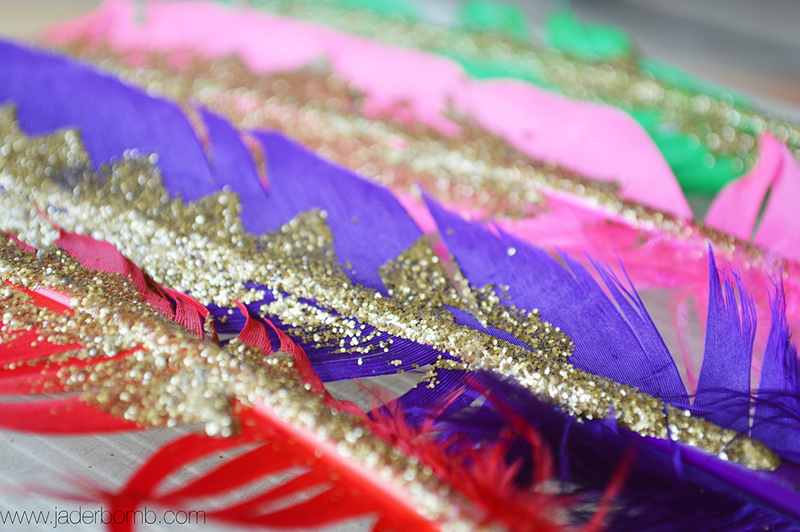 You guessed it, I had to break out the colorful feathers and yummy gold glitter. These are really easy to make and in no time you can bring a room from blah to BAM! 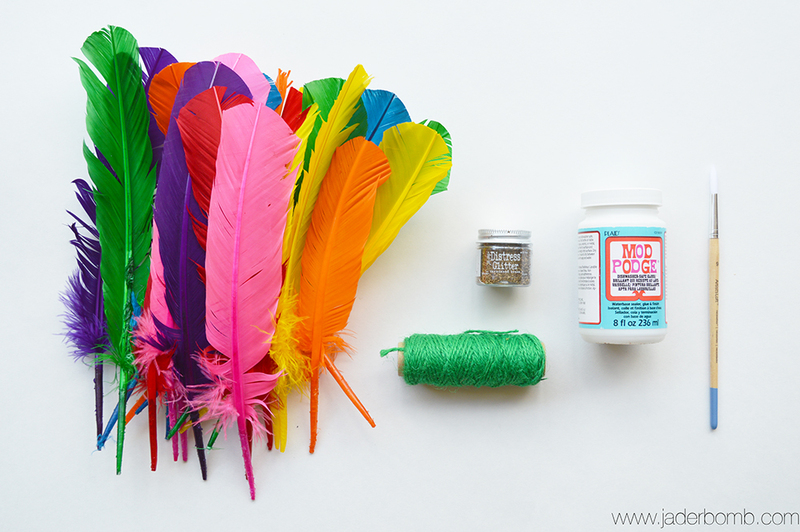 Rainbow Feathers | Colored Twine | Mod Podge | Craft Brush | Gold Glitter The first thing you will do is slather some Mod Podge onto the top of your feather! Next sprinkle your choice of glitter on top of the Mod Podge! 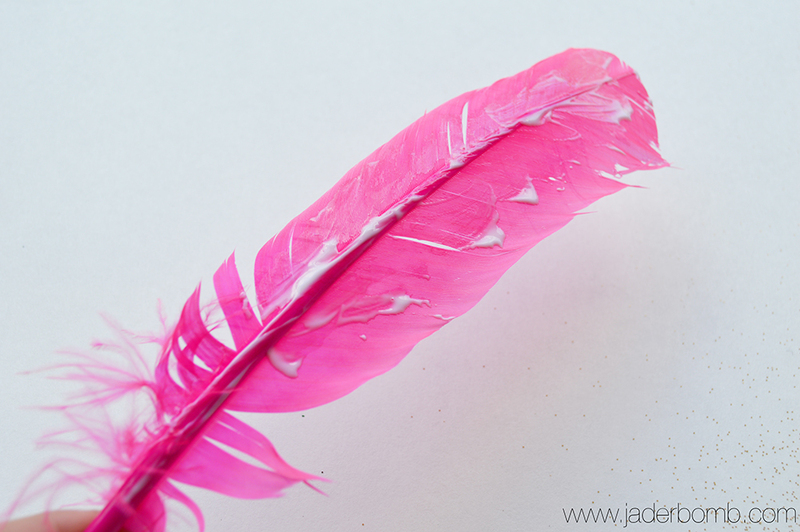 If you want to save your glitter place a piece of paper under your feather. Once all of your feathers are dry you can start tying your twine around the tips. 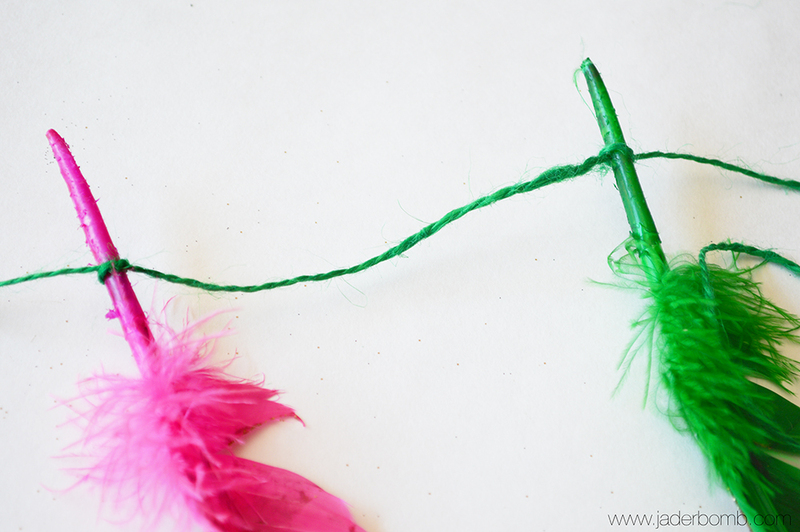 Tip of advice: Make sure your feathers are facing the same direction when tying the twine around them. VOILA! 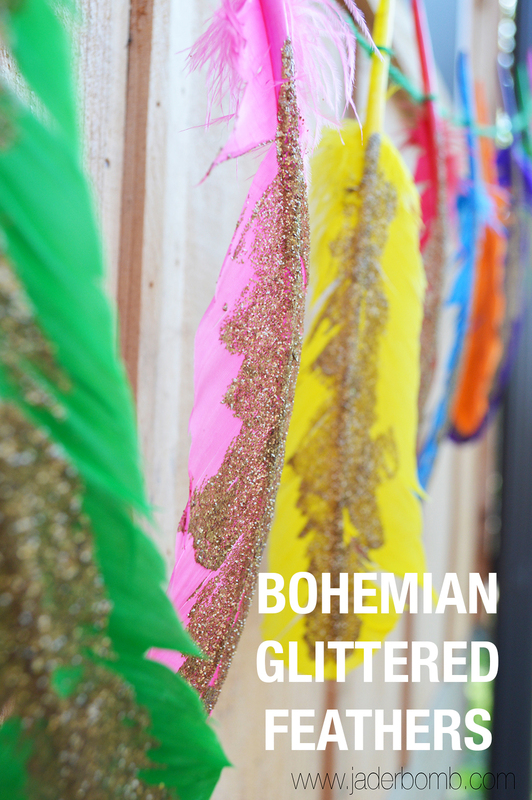 We have the gaudiest batch of glittered feathers you have ever seen in your life! What does that word mean…. Google it! I know my friend Aunt Peaches would drool over these and she would probably wear them in her hair! Seriously. I am totally pleased with the way they came out and if you are anything like me then you like lot’s of the same things all together to form on cluster of awesomeness. Enjoy y’all! Make sure to follow me on ALL social media sites!! Just look up JADERBOMB and you will find me!!! 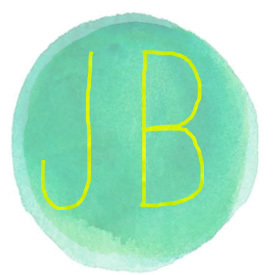 At the TOP of my blog you will see ton’s of little round buttons that you can click on also. They will take you directly to me all over the web world!